The aim of the event will be to raise money of three charities, London Legal Support Trust, AvMA and Sparks Children’s Medical Research . 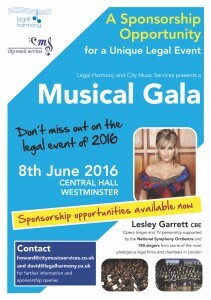 Sponsorship packages are available, please contact David Smith at David@legalharmony.co.uk for more information. Tickets will be available through Central Hall Westminster ticket office in due course. We shall also be holding a couple of our regular competitions at Southwark Cathedral, dates to be announced shortly. Catrin Griffiths discusses the importance of working collectively and how events such as Legal Harmony can bring firms together. The fourth choir to speak to The Lawyer is the choir from Norton Rose Fulbright. Read about their humble beginnings in 2007 as a choir established for their carol concerts to their successes in the Music in Offices competition.